Today I made a sympathy card for Kelly to send along with the tribute book. I had always loved the little Sizzix flower die and had used it many times so when I saw it came in a full size die I just had to have it. Today I chose to use it for my sympathy card. My card base paper was black cardstock and I topped it with an SEI Ivory patterned paper that had black velvet accents. I used Scrapbook.com's October Card Sketch Challenge #3 for my design. 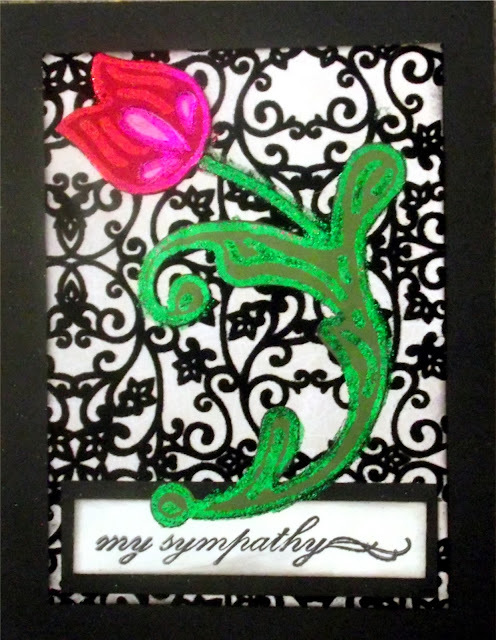 Although I kept the orientation of the card and sentiment the same I positioned my flower vertical as well. I added glitter accents to the flower as I heard Catherine had liked bling and felt it would be fitting. I am also entering this in Word Art Wednesday Anything Goes Challenge #103. Thanks for dropping by again. Hopefully I will get to more creating now that the weekend is nearly upon us and I will have more to share with you. A very appropriate and lovely card. The flower is very cute. Thank you for posting with us this week. Your beautiful work really is appreciated by so many. Come back soon! This is very pretty, Paula. Thanks so much for sharing your beautiful art with us, and have a blessed week.